By the time the audio CD format was up and running 20 years ago the boffins were well on their way to introducing video on those little silver discs. Previously the only way to watch a full length feature film on a disc was by the Laservision format. Those bulky LP-sized analogue discs with their equally bulky players never captured the public’s imagination and remained a technological dead end. Eventually ways were found to cram analogue films onto 4″ discs which became known as VideoCDs or VCDs. This was another format that found limited success here (although in some parts of the planet VCDs were hugely popular as they were cheaper to produce/copy/pirate than Video tapes). 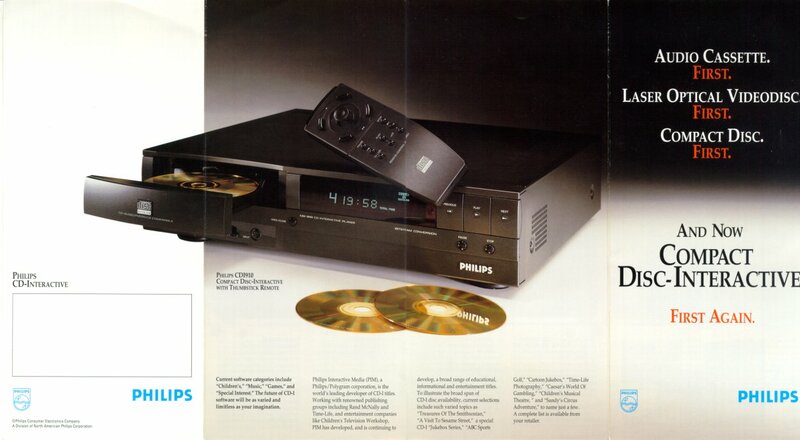 The Philips CDi was the next step on from VCD. 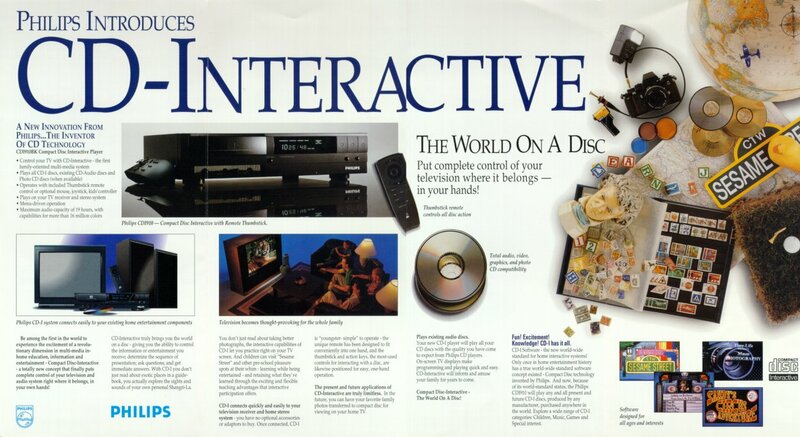 It was an interactive multi-media technology that combined sound and video on a CD that was designed from the outset to be viewed on your main TV rather than via a games console. The key to the whole thing was the ability of the technology to permit random access to any point on the disc. This had first been tested by coupling a Laserdisc player to a computer. Once this had proved to work the next stage was to combine this concept into a new machine that utilised a standard sized CD in a player that looked like a Hi-Fi seperate rather than a tacky games console. Of course the main use of a CDi player was still to play games. The novelty was navigating around the screen using a wireless remote control rather than by using a computer keyboard or a wired joystick. The Philips CDi format was available for the relatively brief period of 1992 to 1998. Too late they realised that the success or failure of any machine depended on the software available to use on it. Without a stream of new games being developed solely for the CDi player people soon became bored with the ones they already owned. More people were buying computers and by 1998 the DVD all-digital format was ready for release alongside the now much improved games consoles like Dreamcast and Playstation. I was one of the relatively few people who purchased a CDi player when the format was first introduced and at the time I actually enjoyed the experience. Somewhere on my shelves must still be games like “Mad Dog McCree” where you could have gunfights with real cowboys rather than cartoon characters and the “Vegas Girls” adult poker game. At one point Philips even offered a modem and a “Net on your set” CD which used the CDi player to access the Internet. In theory this was a wonderful advance for the TV set in your lounge in the mid 1990s. A slow modem, dial-up access and “typing” an eMail one letter at a time with your remote control on a virtual keyboard made it more of a novelty than a useful tool though !! When you think what you can do with the current batch of mobile phones you realise how far we have come in a decade and a half !! The next big thing over the next year or so will be the final convergence of TV and Internet with Internet enabled TV sets or set-top boxes. Where we will be in another 10 years I hate to think. By then a CDi player will be about as useful as a wind-up Gramophone. Comments Off on What was CDi ?